The start of the festival is now just a few days away – we can’t wait to catch up with old friends and make some new ones. 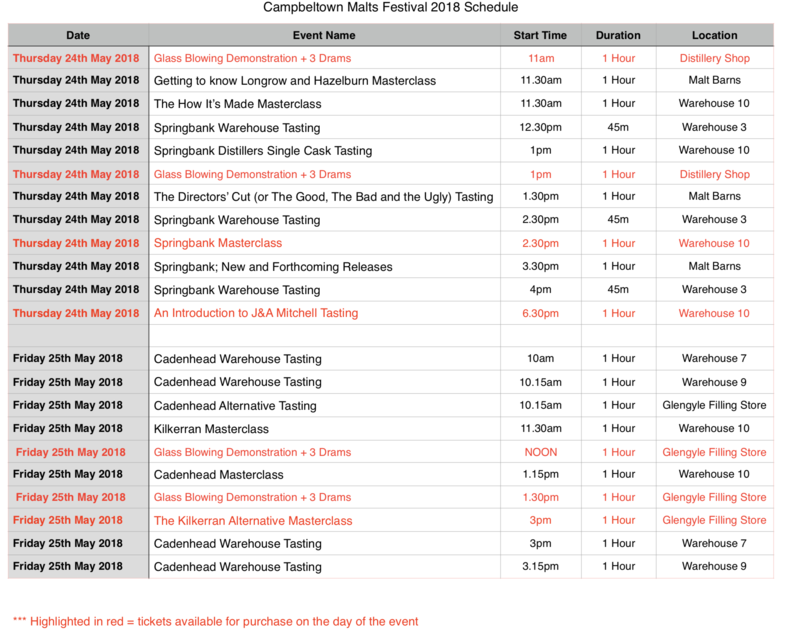 Over the course of this post you will see a complete schedule of events organised by Springbank, Mitchell’s Glengyle and Wm Cadenhead’s. We are aware it is rather lengthy and, at times, information heavy so please take your time to familiarise yourself with it – especially the sections about events you plan to attend. Should anything be unclear, please feel free to contact us with any questions you may have. Also, if you are unsure of what to do or where to go while you are here attending the festival, our staff will always be around to help you in any way we can. On the evening of Tuesday 22nd May the sales team from Cadenhead’s will be hosting a tasting exclusive to Cadenhead Club Members. Taking place in the Springbank Malt Barns, members are joining the team for the first ever Cadenhead Club Festival Tasting. Guests will take part in a blind tasting of 6 cask samples in a relaxed and laid back session. On Wednesday, festival staples return as we host the Springbank Society Tasting and our distillery dinner at Springbank Distillery. To kick off Springbank’s program of events we will be holding an exclusive tasting for our dedicated Springbank Society Members. The tasting will start at 11:30am in the Malt Barns. During the tasting attendees will try a number of samples as they help pick the next Springbank Society bottle – to be released this autumn. Once again we will be hosting an exclusive dinner at the distillery on the eve of our Open Day. This year, guests will be treated to dinner in the surroundings of our wonderful Malt Barns. This will take place on Wednesday 23rd May 2018 at 7pm. On arrival to Springbank Distillery, guests will be greeted with a champagne reception in our marquee which will also feature a range of locally sourced canapés. Following this, they will sample three whiskies, hand drawn from the cask by a member of our senior production team. Guests will vote for their favourite of the three and the chosen cask will be bottled for everyone to take home on the night. Diners will then be led to your table to enjoy a four course meal with a specially selected wine to accompany each course. To end the unique experience, each attendee will be presented with their own exclusive 70cl hand drawn bottle, chosen earlier in the evening. Four local restaurants are putting on special menus to celebrate the Campbeltown Malts Festival on the evening of Wednesday 23rd May. At each dinner a Sales Team Member will be on hand to serve all the guests with the three drams that are also being sampled by attendees of the distillery dinner that night. One lucky person from each of the dinners below will win a bottle of the whisky chosen at the distillery dinner. This bottle shall be collected at the Cadenhead’s Whisky Shop the following day. For more information or to place a booking, please contact them directly using the numbers below. 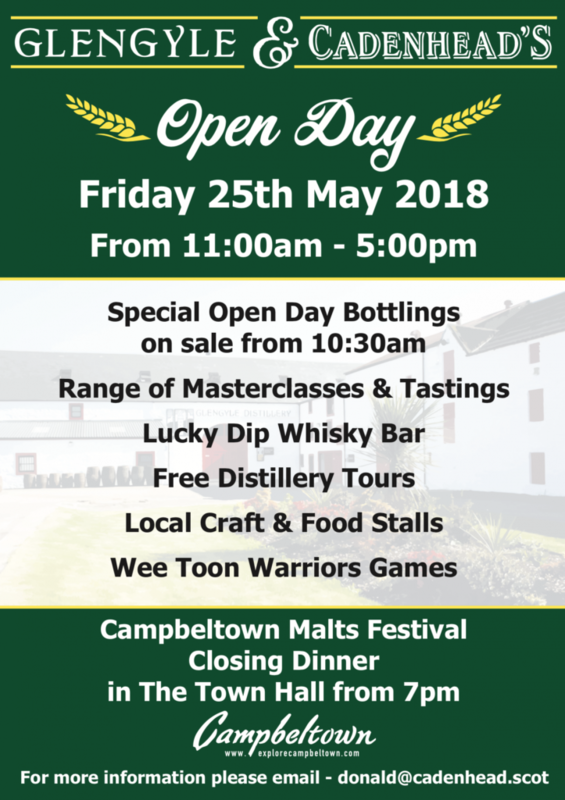 The Springbank Open Day takes place on what is now the third day of the Campbeltown Malts Festival. Events will start at 11am and will include a wide variety of activities such as free distillery tours, a range of tastings and masterclasses, local craft and food stalls, exclusive bottlings, the warehouse whisky bar and more. The Springbank Open Day Bottles will be available at 10.30am and will be on sale at Springbank Distillery. We would advise guests to plan ahead if you are booked to attend one of the earliest masterclasses. Grant Macpherson will guide you through 3 drams from Springbank Distillery, a Springbank, a Longrow and a Hazelburn, as Angel’s Share Glass provide a free glass blowing demonstration. Come along and see how the glass plays a big part in your whisky tasting experience. Explore the key expressions from Springbank Distillery’s Longrow and Hazelburn range to experience what these releases have to offer. Whether it’s the smoky and mysterious Longrow bottlings or the lighter, sweeter Hazelburn, there will be something here for every fan of the Springbank range – including an Open Day bottling launched just 1 hour before this tasting starts. Sample a selection of the finest whiskies from Springbank, hand drawn from the cask in one of our traditional warehouses by a senior member of our production staff. A selection of exclusive Single Cask bottlings from our range that have been released throughout the world. An excellent chance to try rare whiskies from around the globe, all in one tasting. Director of Production Findlay Ross, Springbank Sales and Marketing Director Ranald Watson and Sales Director for Wm Cadenhead’s Mark Watt combine for a very special tasting that will take you through a wide range of drams and topics that will cover every corner of J&A Mitchell. The 3 hosts have selected their favourite casks and will share samples with those in attendance. They will also be answering audience questions about the company and after all that they have a big surprise lined up too. Join one of the Springbank Sales Team in enjoying a selection of drams from across the Springbank selection. Whether you are new to Springbank or you are looking to enjoy some old favourites, this is the tasting for you. This tasting may include some very recently released bottlings (that’s a clue!). At this tasting you will try some of the most recent limited release bottlings from Springbank Distillers. May has seen a number of new whiskies appear and this is your best chance to experience them all in one place. This is also an opportunity to taste some whisky that nobody has tried before, including 2 of the Open Day bottlings. Get to know our company and our core products – these are the drams that provide the foundation to our business. Perfect for those just getting into whisky or who want to go back to basics with Springbank, Glengyle and Wm Cadenhead. The Springbank Warehouse tastings will be 45 mins long. All other tastings during the Springbank Open Day are scheduled for 1 hour. Back by popular demand, the Spooks Tour will return to the most haunted warehouse at Springbank Distillery for the Open Day on Thursday 24th May. Be prepared for a few scares along the way. Starts at 7pm – meet at the distillery office. The traditional Open Day Ceilidh will once again be happening in the Malt Barns and you are all welcome to come along, of course. Things will get underway around 7.30pm and will feature a mixture of ceilidh music and more modern tunes throughout the night. Food is being supplied by Argyll Bakeries and Craig Dixon is providing soft and alcoholic drinks. The final day of the Campbeltown Malts Festival 2018 is dedicated to Mitchell’s Glengyle Distillery and Wm Cadenhead’s. Our Friday events will take place at Mitchell’s Glengyle Distillery where there will be hourly free tours of the distillery, local stalls and the popular (and world famous!) Cadenhead Lucky Dip Bar. In addition, there will also be the Fyne Ales bar and a Cocktail Bar too. The Kilkerran Festival Bottle will be available at 10.30am and will be on sale at Mitchell’s Glengyle Distillery. We would advise guests to plan ahead if you are booked to attend one of the earliest masterclasses or tastings. Sample a selection of the finest Cadenhead whiskies with a member of the Cadenhead Sales Team. Each dram will be hand drawn from the cask inside Warehouse 9. Sample a selection of the finest Cadenhead whiskies with a member of the Cadenhead Sales Team. Each dram will be hand drawn from the cask inside Warehouse 7. Throughout it’s 176 years of history Cadenhead’s has been about more than just excellent whisky – this is a chance to try some of our alternative spirits. The tasting will include a selection of Gin, Rum, Cognac and Cachaça from current bottlings and cask samples of spirits from around the world. Familiarise yourself with the house style of Kilkerran, our bottlings to date and perhaps one or two of the early experiments from Glengyle Distillery. A comprehensive Kilkerran experience to celebrate the Glengyle Open Day. Grant Macpherson will guide you through 3 Kilkerran drams, 12yo, 8yo Cask Strength and a mystery bottle, as Angel’s Share Glass provide a free glass blowing demonstration. Come along and see how the glass plays a big part in your whisky tasting experience. Traditionally taking place on the Thursday of the festival, this tasting now has a new home. Featuring the entire Cadenhead Sales team and a wide selection of top quality Cadenhead drams, the “Big Cadenhead Tasting” looks like it fits in well on Friday. This year sees the Authentic Collection go head to head with the International Releases as the team guide you through the merits of each side. We also have a surprise planned for those in attendance – we can’t wait to get this tasting started. We have teamed up with a mixologist to create an alternative way to enjoy Kilkerran Single Malt Whisky. During this tasting you will enjoy Kilkerran Cocktails as a member of the sales team tells you about each of the whiskies used. These cocktails will also be available from the Cocktail Bar. Note: Please remember to print off your tickets for all the events you are attending and bring them with you. The Wee Toon Warriors have organised 5 small challenges in conjunction with the whisky making process for you all to take part in throughout Friday. The Grubby Grubber – See how fast you can shovel a ton of malt. Have you got what is takes to be a master maltster? A tonne of Mash Tun – How quickly can you fill the wash back with yeast? Not so still – Can you fill the still and make it overflow? Roll out the barrels – Good, old fashioned barrel roll. Pallet Perfect – Can you build the pallet for dispatch without smashing the bottles? We can’t wait to see you all give these challenges a go during during a busy day at Mitchell’s Glengyle Distillery. Thanks for giving this post your full attention: we think that’s everything!